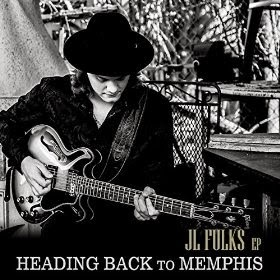 I just received two new EP releases, Live in Studio 101 and Heading Back To Memphis from JL Fulks and they are quite good. Live in Studio 101 opens with shuffle track, Before I Go Insane. With it's Freddie King feel and tight riffs, this is a nice opener. Joining Fulks who handily manages guitar and vocals, is Jim Kinder on drums, Chris Reynolds on rhythm guitar and Ron Calese on bass. Twang Thang is a breezy blues rocker instrumental. With just a pinch of country riffs this has style. On slow blues track, I Believe In Love, Fulks really shows his chops on guitar. Clocking in at over 9 minutes, Fulks does an excellent job of making the time fly with inventive riff after inventive riff. Very nice! On instrumental funky/jazz track, Watch Yourself, Fulks and crew get a nice groove going showing another facet of Fulks repertoire. His second EP, Heading Back To Memphis, shows a bit more maturity with more fully crafted tracks. Opening with title track, Heading Back To Memphis, Fulks is joined by Rockin' Jake on harp, Ian Jones on drums and Ken Burgner on bass. A cool 12 bar number, this track has a nice bite of Chicago and some cool solo riffs from Fulks and Jake. Moonshine Blues has a swampy feel with Fulks on slide with reverb. A heavy overtone gives this track a hot texture. Possibly his best yet! Wrapping the release is Back To You, a rock n roller with a Chuck Berry/Alvin Lee feel. Another well written track, I'm looking forward to hear more from Fulks.